← #VOTY17: It is Now Time to #VOTE4VOTY! One of my favorite cars in the first decade of the 21st Century has been the Ford Focus. From my first sampling, I enjoyed the idea of a European Ford recreated without too many deviations from the original design. Every one of them has been a four-door sedan, mainly an SE model. I got a car with quality materials, loads of room, a spunky motor, a smooth ride and fantastic handling. Yet, I knew I had to face my own words when it came to the latest redesign of the North American Focus. At first, I was livid about how Mark Fields danced around the redesign calling it a “bold move.” Fields had to because an angry motoring public hoped to get a stateside version of the latest European Focus on a platform shared with the Mazda3 and Volvo C30/S40/V50. We felt that the bolder move than the elimination of the hatchbacks and wagon in favor of a fish-out-of-water two-door coupe. They kept the four-door sedan, though. At least that helped to ease the temper a bit. 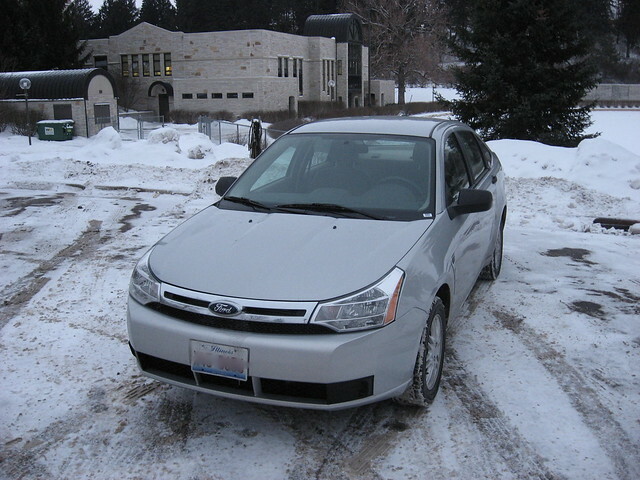 What I sampled was a 2008 North American Focus SE sedan that surprised me. The surprise was not the ease of the eye on how the new design looked in the flesh. Simply, Ford did not mess with a good thing underneath this car. To start with, Ford’s familiar Duratec 20 was as spirited as ever. This is kind of compact car motor that you simply love to touch the accelerator and let it do its work. The four-speed automatic is carried over without complaint from this driver. In all, this combination turned a 25.4MPG loop, which is lower than the typical 27-28MPG I normally get on the Focus. The car was shod with Hankook tires (as with a good chunk of Fords I’ve driven lately), which is now becoming Ford’s tire supplier of choice in terms of cutting costs. One complaint I had with the previous version (1.3, if you’re keeping score) was how the handling felt a bit wild for the car. It seems tamer now. They also tuned up the ride to be a bit firmer than before. It steers very crisply and brakes just fine. Anti-lock brakes and traction control were included in my sampling. The drive feels more along the lines of version 1.2 than of 1.3. Think of how Microsoft XP is actually better than Vista…oh, wait, I’m an Apple guy, but you get the idea. And, no, this one did not come with SYNC. Nor was Sirius enabled for the audio system, despite its position on the button farm in the middle of the dash. It didn’t even have cruise control equipped with my sample, but it did have a tilt steering wheel this time! The word “heinous” needs to be said here. It is not the overall shape that I dislike, but the details. The devil’s always in the details! The front end will grow on you, but I’d rather have a better headlamp design to go along with Mark Fields’ bold move grille. I’d also get rid of those ugly fake ducting on the side forward the front doors. Better still, the chrome trim around said ducting. Oh, and the lettering for the Focus is…yes, heinous! Inside, I can do without the steering wheel design. I also wished that the gear lever for the automatic would be a bit taller and the plastics of a higher quality and better feel. However, I liked how they went with the HVAC/Audio system theme from the new Escape with the readout on top of the dashboard. I can think of a better design, but I’m not Mark Fields. He wants bold moves…I want logical, yet fun design! I’m sure Jim Farley (formerly of Scion and Toyota, now of Ford) would agree. A few outstanding features made the interior better than before. Gone is the noisy door locking system, replaced by a North American Ford parts-bin lock set that is very quiet. They also installed conventional power windows switches instead of the ones carried over from Europe. Lastly, the seats are much more comfortable than the ones on version 1.3. It’s still as roomy as before, but I do miss the crank-type height adjustment. It also seems that they may have shorted up on the rear leg room from all previous versions. The state of Ohio decided to switch their Department of Administrative Services-run fleets to the Focuses. Though some have complained about the size inside, I can assure you that I still have plenty of room behind the wheel of the Focus. However, the Cleveland Plain Dealer called the cars “homely.” Perhaps, but with a few modifications, it would be less of a joke to drive. Of course, I’d consider it, but not at the top of the list. The driving attribute is a buy, but there’s just too many details that detract from actual delivery, especially when an SE sedan meeting my specifications will set me back $17,605. This includes everything on my sample vehicle, plus cruise control and Sirius satellite radio. So, it’s homely. It’s not the prettiest thing on the road, but it still does the job, plain and simple. Maybe it could grow on you. 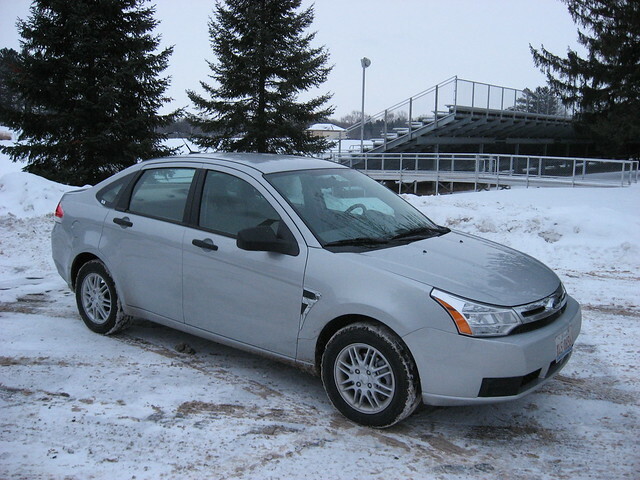 PRE-OWNED VEHICLE INFORMATION: Per a search on several car shopping sites, V&R found there were several 2008 Ford Focuses available between $2,500 and $7,000. Mileage and condition vary, but most were found with over 80,000 miles on the odometer, the highest being over 222,000 miles. Always have any vehicle inspected before purchase.